Lars Båtefalk, born 1966, is Senior lecturer in history at Högskolan Dalarna. 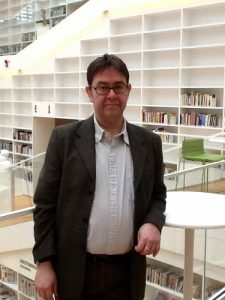 He took his doctorate at Uppsala University in 2000 with a thesis on the Temperance organization in Sweden during the first half of the 1800’s, and has since taught and done research mainly focused on social, ideological, cultural and political history during the 1800- and 1900´s. Båtefalk has oriented towards issues related to the socialization and education of children and youngsters within the context of the educational reform movement between the late 1800´s to mid-1900´s. For the moment Båtefalk is working with a text on education for peace and pedagogical ideals connected with this in an anthology on a pedagogical reform school called the Siljan School in Dalarna during the 1920´s and 1930´s. Båtefalk also teaches on courses on Global history and takes part in professor Holger Weiss seminar on Global history at Högskolan Dalarna.